CData Sync is a lightweight web application that helps you easily replicate data into any data warehouse in minutes. 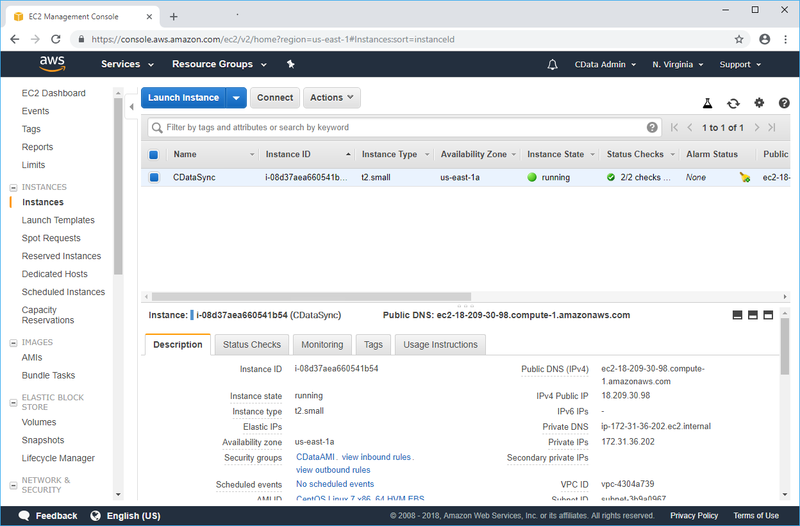 The CData Sync Amazon Machine Instance (AMI) comes as a Linux-based instance with CData Sync pre-configured and ready to run, with no additional configuration necessary. The AMI can be found in the AWS Marketplace as CData Sync. You can launch a new instance of CData Sync from the Amazon AMI in three simple steps. Subscribe to the AMI, and accept the Terms and Conditions. Once you are subscribed, you can launch a new instance of CData Sync. Configure the instance-type, instance details, volume, tags, and security group. CData Sync runs on the default HTTPS port (443); ensure this port is accessible from the IP address you connect to CData Sync. Next, create a new key-pair or select an existing one. To log in, the default username is 'admin,' and the password is the instance's randomly generated Instance-ID, which you can find from the EC2 management console. You can now connect to your data sources, secure connections with SSL, and standard authentication methods. See the "Getting Started" chapter in the help for a guide to setting the required connection properties and setting up access control. The CData Sync AMI works out-of-the-box without additional configuration. However, advanced users can customize CData Sync to manage replications with more precision. CData Sync supports several replication sources and destinations out of the box, but there are many additional connectors available. To add a new source or destination in the CData Sync instance, download and install the corresponding Java Sync Connector. The CData Sync AMI is licensed for a base number of connections. If you would like to add more connections, contact our sales team. By default, the CData Sync AMI generates a new self-signed certificate upon creation, preventing any two AMIs from sharing the same certificate. However, not all client applications accept self-signed certificates. To get around this, you can replace the default certificate with a trusted one. First, obtain a trusted certificate from a certificate provider. This certificate must match the public URL provided by AWS. Note that the keystore path is a relative path starting from the Jetty Base directory (/opt/datasync). After saving the modifications to this file, restart the Jetty service for these changes to take effect.